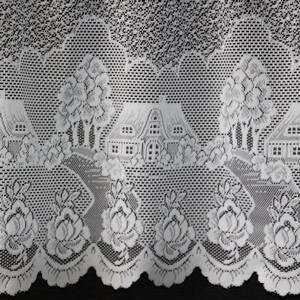 Country Cottage Lace Cafe Curtain has an overall height of 90cms. 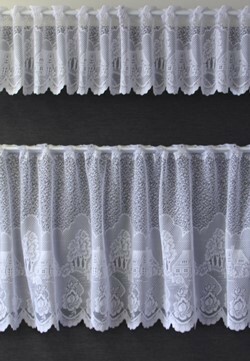 This comprises of a 30cm top valance and a 60cm bottom section. It will fit most any window by allowing a different gap between them. Perfect for kitchens or anywhere you need a little privacy but still like to look out between the top and bottom sections. You will need to seperate the top and bottom pieces by cutting some connecting threads. Both sections are then ready to hang with a woven in rod pocket suitable for a 16mm rod easily found at any hardware. Its up to you to decide if side hems are necessary. Most would think not. 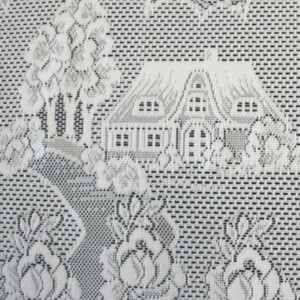 Polyester and easily removed to wash when required. It's the perfect addition to an older home at very little cost.